January is in many ways the beginning of the gardening year for me. This is when I plant most of my seeds for growing under lights indoors. It is also when seeds from seed exchanges (mostly irises, in my case) tend to arrive. These get planted outdoors in pots sunk in the ground. 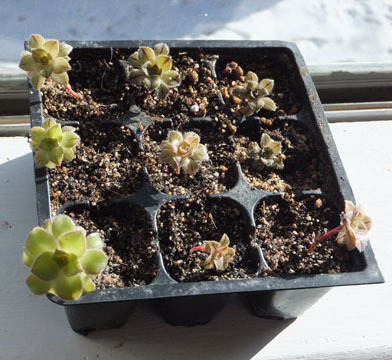 The exposure to winter cold and varying moisture helps them germinate. We moved into winter steadily and gradually this year. Snowfall early in January was followed by a week or so when temperatures never rose above freezing and lows were near 0 Fahrenheit. 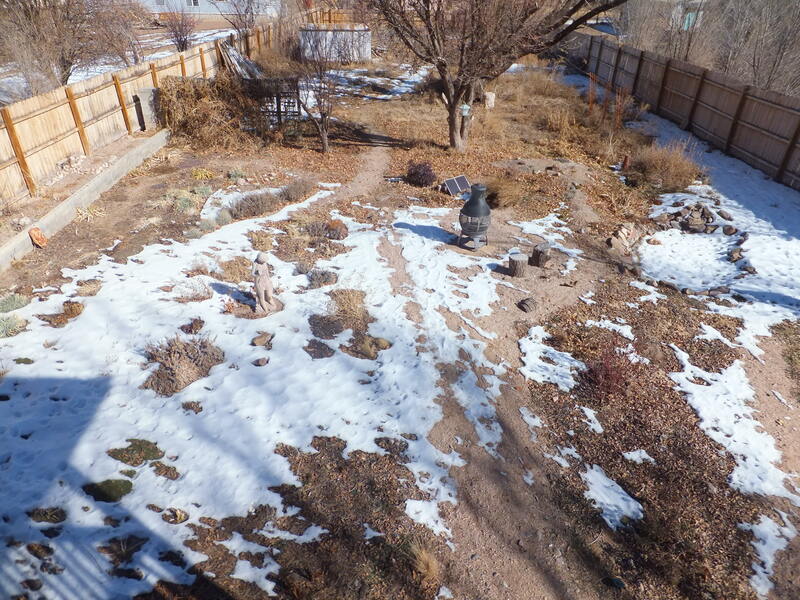 Things are warming some now (highs in the 40s), and the snow is melting…very slowly. 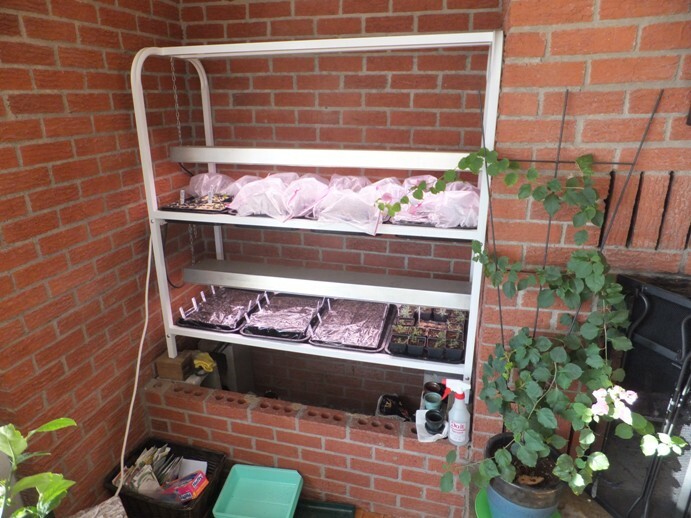 Two weeks ago, I planted succulent and cactus seedlings for growing indoors under the lights. I got many more of these than in previous years. The cacti are all hardy species native to New Mexico. After growing them on for a few years, they will be planted outside. The seeds all came from Mesa Gardens in Belen. Echinocereus coccineus, Escobaria vivipara neomexicana, Escobaria missouriensis, Mammillaria grahamii, Mammillaria meiacantha, Mammillaria wrightii, Pediocactus simpsonii, Sclerocactus mesa-verdae, and Sclerocactus parviflorus. The succulents are indoor plants that looked like they would be fun and interesting to grow: lithops, conophytums, Adenium obesum, Euphorbia obesa, Haworthia margaritifera (I think this means it will bring me margaritas), and Talinum caffrum. Except for the adenium, these came from cactusstore.com in Phoenix. 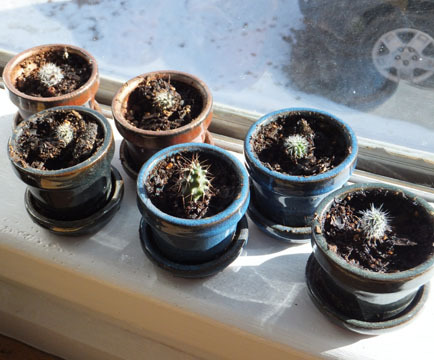 Most of these have already sprouted, as have some of the cacti. 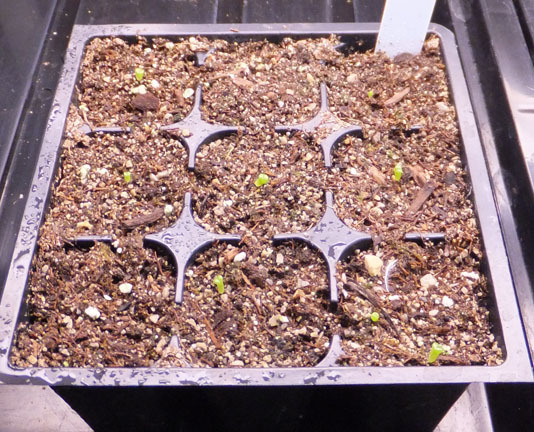 I was quite surprised at the spindly appearance of the Euphorbia obesa seedlings. 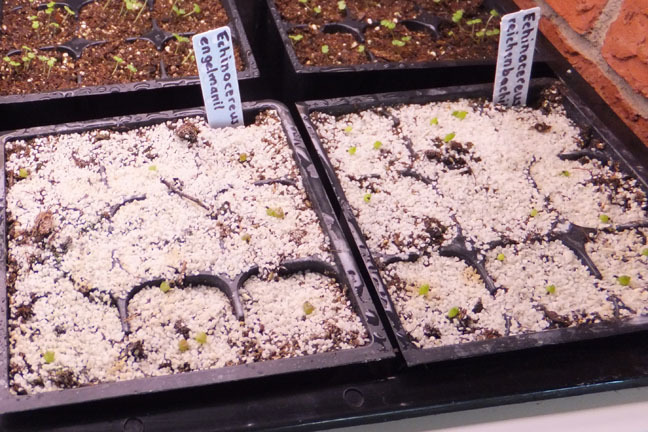 From the look of the mature plants, I expected the seedlings to be more cactus-like. This weekend I planted tomatoes and peppers of several different sorts, herbs, hollyhocks, and Shenandoah petunias. I also planted some seeds I had harvested from my Mammillaria prolifera cactus and my Meyer lemon tree. This is earlier than the usual recommendations for starting the transplants, since our average last frost is not until the beginning of May. However, conditions are so harsh here in spring that I find it is better to set out larger plants and give them plenty of time to harden off and acclimate to the outdoors before planting. The grow lights have proven to be one of my best gardening investments ever. 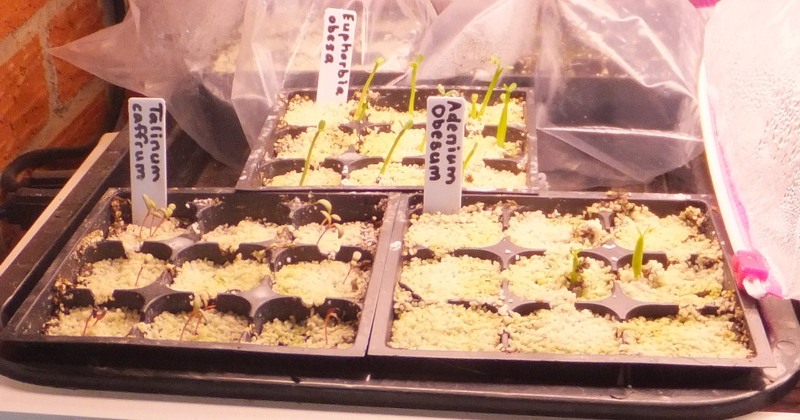 Being able to grow plants from seeds not only saves money, but is a very satisfying and fun process. Furthermore, it allows me to try things that would be difficult to obtain any other way. And I sometimes end up with extra seedlings to share with friends. Here’s my second excursion into the world of video. This time, I’m planting seeds I received from the seed exchange of SIGNA, the Species Iris Group of North America. I share my method of starting seeds of plants (like irises) that require a period of cold stratification in order to germinate. Enjoy! I got a new camera with video capability in December. I think it would be nice to make videos to share my iris bloom season in the spring. I’m a complete novice when it comes to taking and editing video, so I figured I should start learning as soon as possible! 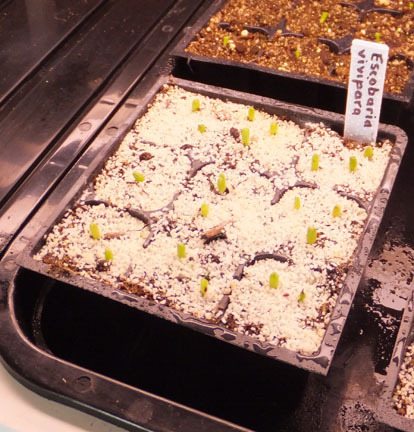 This weekend, I put together a 9-minute instructional video on starting flower seeds indoors. Nothing really novel or profound here, but it did give me a lot of practice with the software! 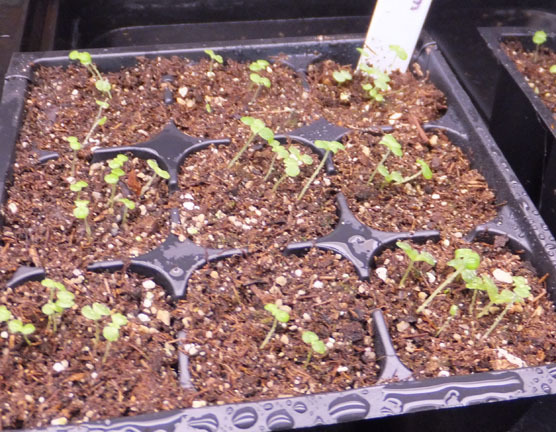 Follow-up, two weeks later: Here are the Johnny-Jump-Up seedlings, growing happily under the lights. Mid-winter is a philosophical, almost mystical time, for a gardener in a temporate climate. Casual gardeners no doubt forget about gardening entirely at this time of year. Our local nurseries all close from Christmas to New Years – presumably because hardly anyone would show up if they stayed open. For the plants in the garden, this is essentially a dormant time. They wait in quiet slumber for spring to come, completing the cycle of activity and rest that is common to all living things. This is the time that connects the end of one growing season with the beginning of the next, completing the circle. I might use this space to write about all the fascinating things that plants do in winter, away from our active notice. But instead I’ll share some thoughts on two different ways a garden can move from year to year. The first way might be called “reinvention”. In this model, trees, shrubs, and perennials are expected to survive the winter and maintain the basic framework of the garden. Annual flowers and vegetables die at the end of the season and are replaced anew from seed the following spring. If the garden is relatively new, we may acquire new perennials and trees as well. We may even cycle through perennials every few years, as the allure of new plants compels us to send the current residents on their way to free up space. Starting over each spring is truly a great deal of fun. 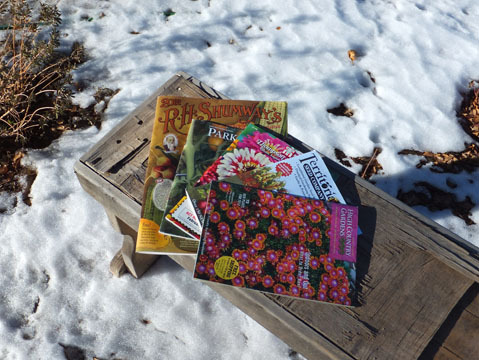 Since I was a teen, I looked forward to the arrival of the garden catalogs in January, and the long hours of temptation and anticipation they provided. There’s always a new tomato to grow, an new iris to collect, a new batch of violas to be set out. When I was young, this was what a gardener’s winter was about! The second way of bridging the seasons might be called “recycling”. In this way of doing things, most (if not all) of next year’s plants come directly from last year’s garden, either perennials that we have kept going, or annuals and vegetables raised from last year’s seed. We can let desirable plants reseed in place, or – if more care is needed – harvest and save seed for replanting next year. Recycling your garden reinforces a mindset of sustainability, taking us back to a time when there were no new plants or exotic seeds from far away to provide garden novelty each year. Recycling your garden can offer an alternative to the increasingly commercialized garden industry, which is threatening the biodiversity of our food crops by narrowing the once enormous range of local heirloom varieties down to a small assortment of hybrids obtainable only as new seed each year from commercial sources. I recommend gardeners all acquaint themselves with organizations like the Seed Savers Exchange that are working hard to preserve heirloom flowers and vegetables. I’ve made a conscious choice to move more toward a recycling garden each year. 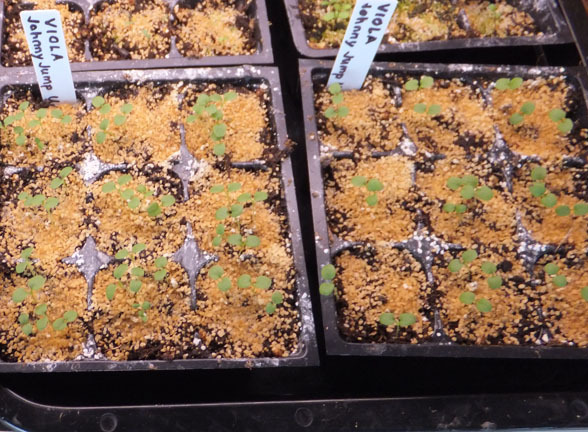 I’m starting to save vegetable seeds, to encourage ornamentals that reseed themselves, and to explore perennial vegetables, such as asparagus and walking onions. I like the change in mindset involved: the plants in my garden become less disposable commodities, and more like long-term resources. That said, I think there will always be a place for reinvention in my garden. Gardening is my hobby after all, and it would lose some of its interest if there were no exploration of new plants. Furthermore, my garden is still a new one, and experimenting with new plants seems altogether reasonable when new ground is brought into cultivation. Still, I cannot but reflect that the “reinvention” paradigm has led many a gardener down a perilous path where the need for acquiring novelty outstrips the space, time, and money available. I’d like, in a few years’ time, to reach a state where the garden I loved the year before returns from its own roots and seeds in spring, and changes are modest and measured.